I can never recall a time in my life when there was no music. When I was a child my parents always had music playing on the radio at home, and even in the car. The first four records I can recall hearing are Patti Page doing "Tennessee Waltz", Bette Hutton doing "Doctor, Lawyer, Indian Chief", Frankie Laine doing "Cool, Clear Water" and Kay Starr doing "Wheel of Fortune." I still listen to these recordings on a regular basis. They are part of who I am. Today is Kay Starr's birthday. She's 88 years young. And she always will be young, thanks to the recordings and films she has given us over the years. Here she is, singing "Wheel of Fortune" on The Wayne Newton Show in the 1960's. This is a short, 1 minute 30 second version of the recording, which runs about 3 minutes. Born in Oklahoma in 1922, her father was full blooded Iroquois, and her mother was Irish. When the family moved to Dallas during the Depression, her mother began raising chickens in the back yard to supplement the family's income. Each day after school, Ms. Starr would go out back and feed the chickens while singing to them. 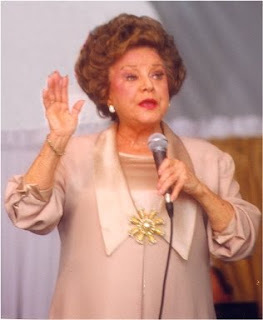 Her Aunt Nora convinced Kay's mother to enter her into a singing contest on the radio in Dallas. She was well received and became known as "The Kid." Whenever a request for a ballad came in the band leader would say, "Let the kid do it." 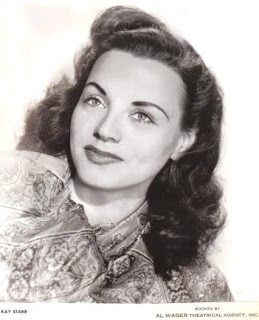 Her first big break came in 1937 when Joe Venuti came to Memphis. The bandleader had a contract that required him to have a girl singer, which he did not. His manager heard Kay on the radio and they approached her family about her making an appearance with the band. For the next two years she would tour with the band each summer. In 1939 she was hired by the Bob Crosby Orchestra for a short time. Her next move was to the Glenn Miller Orchestra. It was while singing with them that she made her first recordings. Finishing high school in Memphis in 1942, she moved to L.A. and joined Charlie Barnet's Band to replace Lena Horne. Those were some big shoes to fill for a 20 year old! But fill them she did. In 1945 she became ill with pneumonia and lost her voice. Facing a serious operation which could have resulted in the loss of her singing abilities, she chose to treat the vocal chords and refrain from singing for 6 months. When she returned, her voice was fuller and more husky. This began her nightclub years in L.A. while recording for Capitol Records, where she performed alongside of such legendary artists as Peggy Lee, Jo Stafford and Margaret Whiting. But her biggest break was yet to come. Late at night on January 17th, 1952 she was awakened by a phone call summoning her to the studio to record a rush release of "Wheel of Fortune." This was her first Gold record and went on to become the #2 song on the charts in 1952. In 1955 she switched labels to RCA where she finally got the chance to show off her wide range of styles, singing everything from "pop" to jazz. Returning to Capitol in 1959 she went on to record jazz, pop and even a country album through the 1970's. At that time she cut back on appearances in order to spend time with her family. By the time the late 1980's rolled around, Ms. Starr had teamed up with Helen O'Connell and Margaret Whiting to tour in the musical revue "3 Girls." In 1993 she toured with Pat Boone, and in 1997 released her first "live" recording, the well received album "Live at Freddy's." When her recording of "Wheel of Fortune" found it's way into the film "L.A. Confidential" in 1997, a police drama set in 1950's Los Angeles based on true events, her career hit another level. Millions more have now become acquainted with this multi talented singer. I am always amazed at the people who approach me in parking lots when they hear "Wheel of Fortune" coming from my speakers. They range in age from fans in their 80's, down to people in their 20's, who are familiar with her only through the movie soundtrack. But for me, when I listen to this recording, I am back in Brooklyn, watching the turntable spin as I sing along to this wonderful recording. Happy Birthday to you, Ms. Starr.